With no date yet set for a parliamentary debate on the “biodiversity destruction” caused by ongoing roadworks in rural areas, there are concerns that by the time the matter is on the agenda it will be too late. The concerns were raised by two Opposition MPs who sit on Parliament’s Environment and Development Planning Committee. They recently made separate requests for a debate on the outcry in the wake of works in Wied l-Isqof and Il-Lunzjata in Rabat and Wied is-Sewda in the limits of Żebbuġ. The controversy erupted after it transpired that vegetation was being obliterated during the concrete surfacing of country roads and lanes used by farmers. The Environment and Resources Authority issued a stop and compliance order, however Times of Malta reported that last Monday works at Il-Lunzjata had nonetheless continued. Opposition MP Jason Azzopardi filed a request to Environment Committee chairman and Labour MP Alex Muscat on March 4 to debate the matter while denouncing the “biodiversity destruction”. 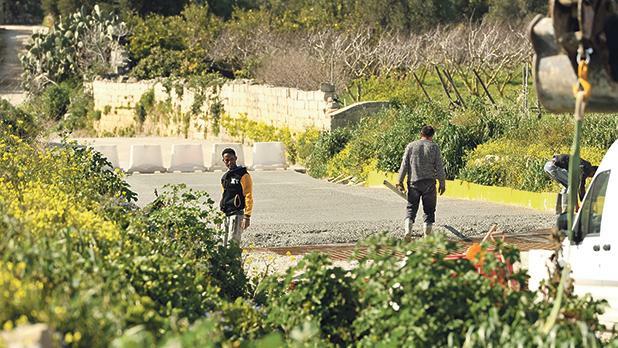 Democratic Party leader Godfrey Farrugia also tabled a similar request in which he expressed his concerns on what he described as physical alteration to valleys and changes to the water course’s profile. He remarked that valleys were subject to various EU directives on water and habitat and that the works could impact neighbouring protected Natura 2000 sites. Contacted by the Times of Malta, Mr Muscat noted that the normal procedure was for the Committee to discuss and agree when to have such an item put on the agenda whenever it convened to discuss the next pending subject. Asked about the date of the next meeting, he said the Committee had yet to agree on a date. Dr Azzopardi expressed his frustration that this was not an isolated incident. “We are yet to debate the revised fuel station policy, even though the request for such debate was tabled months ago,” he said. Furthermore, he expressed concern that by the time the concrete works in valleys were debated, the damage would have been done. Dr Farrugia agreed, also questioning the decision to appoint Mr Muscat to head the Committee once he was also the Prime Minister’s deputy chief of staff. “This might pose a conflict of interest,” he said. Commenting on the controversial roadworks, he lamented that the ERA had not been consulted in advance. “Such roads need to be permeable not to affect the water table and leave enough room for vegetation at the sides to keep growing,” he added.